If you’re familiar with this blog and my OBSESSION with unsweetened raw cacao powder, then you know why I had to create a hot chocolate recipe around it. This glorious foodstuff, made from ground cacao beans and loaded with powerful antioxidants, healthy plant-based monounsaturated fat, vitamins, and minerals such as iron, magnesium, and potassium, is LIFE to me. It tastes AMAZING, transforms my breakfasts smoothies into a delightful treat, and makes me feel good. In short, it’s a healthful way to enjoy chocolate – what’s not to love about that???? The brand of unsweetened raw cacao I’m hooked on and have been purchasing from Amazon for years now is Healthworks . Its organic unsweetened raw cacao is high-quality, amazing-tasting and extremely affordable compared to what I paid when I previously bought cacao years ago at the grocery store (which cost me about $20 for a one-pound bag; Healthworks’ one-pound bag is currently $10.92 on Amazon). I’ve graduated up to the five-pound bag (because that’s how insanely enamored I am with this stuff! ), which currently costs $39.99 on Amazon; one-pound, two-pound, and three-pound bags are also available. Click here to check ’em out! Because this unsweetened raw cacao stuff in this Homemade Hot Chocolate is so inherently amazing, its whole dairy milk is so naturally luxurious, and its pure maple syrup is such a powerful natural sweetener, I decided to limit its ingredients to this impactful trifecta. Initially I toyed with the idea of making this Homemade Hot Chocolate more elaborate: adding peppermint extract, topping it with perfectly coiffed whipped cream dusted with cinnamon. In the end, I felt it just didn’t need any extras; it’s delightfully delicious on its own. It’s sweet without being overly sweet, perfectly creamy, and wonderfully warming and soothing – perfect for a dark winter’s night when you’re sitting at home in the glow of twinkly holiday lights, pondering your new year’s dreams. Or, more aptly for most of us at this time of year: it’s perfect for that dark winter’s night before the major holiday celebration when you’re frantically searching for that last roll of tape that you know just has to be there, because HOW COULD IT BE GONE ALREADY???? YOU HAVE GIFTS TO WRAP! Yeah, Homemade Hot Chocolate is there for you in a situation like that. Take it as a sweet, sweet respite from the holiday hustle. Speaking of hustles, we’ve come to the end now of my little song-and-dance and to the best part, the “on to the recipe!” part. So . . . ON TO THE RECIPE!!! Creamy hot chocolate containing three simple, natural ingredients: milk, unsweetened raw cacao, and pure maple syrup. None of that powdered processed hot chocolate mix for you! Add the milk to a saucepan over medium heat; stir in the cacao powder and maple syrup. Keep stirring continuously, reducing heat as needed, until ingredients are well-blended and milk is steaming. And you're done! 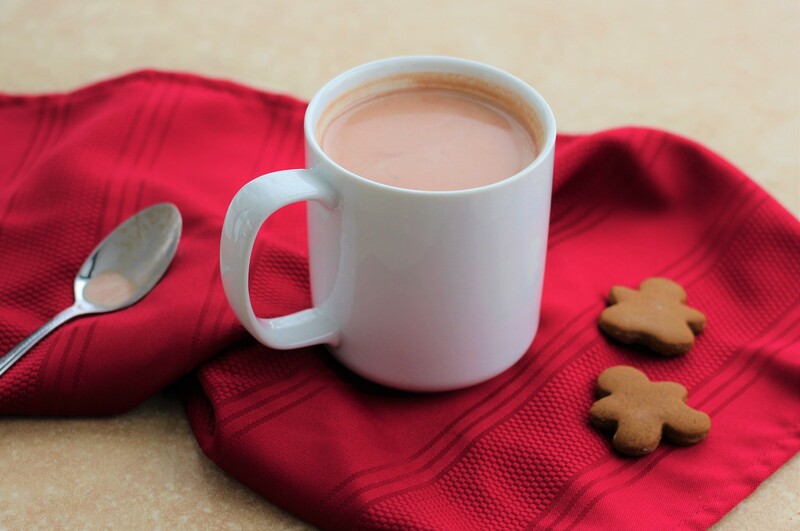 Cheers to enjoying hot chocolate made from natural ingredients!